Joe is a native of Louisville, Kentucky. He graduated from the University of Dayton with a Bachelor of Arts in History and a Certification to teach secondary education. He obtained his Juris Doctor degree from the Brandeis School of Law at the University of Louisville in 1998, where he was a member of the National Moot Court, National Trademark Moot Court and ATLA National Trial Competition teams. Joe joined the firm in early 2002. He focuses his practice in the area of civil litigation, specifically hospital, medical malpractice, and insurance defense, including commercial and personal motor vehicle, insurance coverage, premises liability, product liability, construction, and other general liability and personal injury cases. Joe is admitted to practice in the Commonwealth of Kentucky and United States District Court, Eastern and Western Districts of Kentucky. 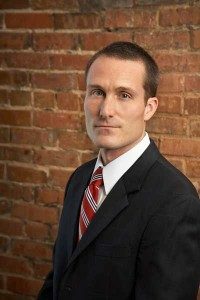 He is a member of the Kentucky and Louisville Bar Associations, the Kentucky Defense Counsel, and the Defense Research Institute (DRI). Joe and his two daughters are avid sports fans and supporters of the University of Louisville athletics, as well as long-suffering fans of the Minnesota Vikings.